Contemporary orchestral string instruments evolved from early folk fiddles and more directly from the wood bowed instruments of the 1500s. 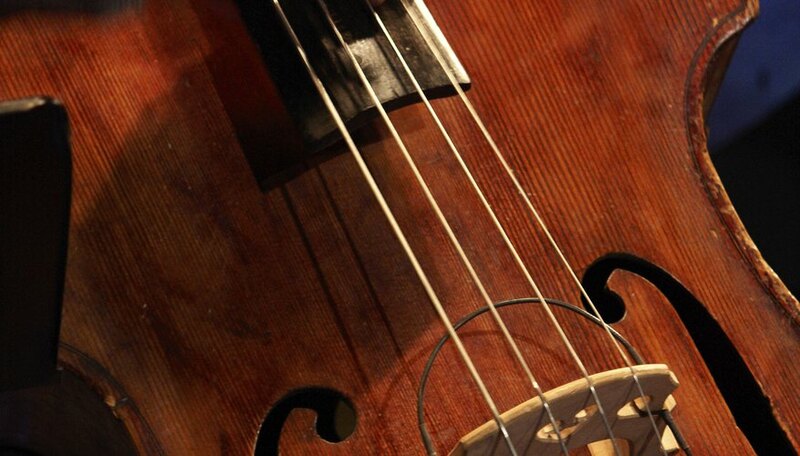 The violin, viola, cello and double bass each have a distinct role to play in a symphony. The cello and the double bass are the largest string instruments and are played da gamba -- between the legs, not under the chin -- while resting on end pegs on the floor. Cellos and double basses are tuned differently but they both are bowed and plucked, although the double bass bow may be grasped overhand or underhand. Celebrated cellist Mstislav Rostropovich said the cello "has the range of all the possibilities of the human voice." The cello has been compared to a tenor; it produces the closest approximation of the human voice of any string instrument and handles both melody and harmony in an orchestra. Cellos are about 4 feet long, are played sitting down with the cello peg resting on the floor, and are tuned to perfect fifths; the four strings are tuned to C, G, D and A. Normally, the left hand controls pitch by pressing the strings and the right hand bows or plucks the strings. The cello repertory includes classic and popular music. The double bass is the 6-foot-plus behemoth of the string family. It plays notes so low that its music is transposed -- written in the bass-clef staff but played an octave lower. The four strings -- E, A, D, and G -- are tuned in fourths, but many professional bassists play with a C extension, which is an extra-long section of the fingerboard that extends the lowest string and allows for greater tuning variations. Bassists grasp their bows overhand like cellists, or underhand like jazz bassist Charles Mingus. The double bass is best suited for long arms and big hands and is played while standing or leaning against a stool. It carries the rhythmic line and harmonies in most classical music but takes star turns in jazz, bluegrass, rockabilly and rhythm-and-blues. What Four Instruments Make Up a String Quartet?